Officially, Charlotte cannot be called a princess, as she has no official royal title. “I’m not a princess. My mother is, not me. I am the niece of a head of state. And with this status, I have some representational duties – nothing very constraining or very exceptional”, she confessed in her interview for Vogue Paris. Indeed, Charlotte has exercised her duties from a young age. In 1997, she was appointed patron of the Public Safety Division, Maritime and Airport Police of Monaco. Every year since 2006, she attends the Ball de la Rose, one of the biggest charity events in Monaco, aimed to support the Princess Grace Foundation. Despite the lack of title, we consider Charlotte Casiraghi a real princess. Have you noticed she’s a spitting image of her mother Princess Caroline? At the age of four, Charlotte and her two brothers lost their father Stefano Casiraghi, who was killed in an accident during the boat race of 1990. After his death, Princess Caroline left Monaco with her children and settled in the French village of Saint-Remy-de-Provence in the South of France. Their loving mother wanted to protect her kids from being exposed to the media. A year later, Charlotte moved to Fontainebleau, where she attended the Lycée François-Couperin. Wishing to enroll in Ecole Normale Superieur, Charlotte failed the exam. However, the stylish Casiraghi graduated from the University Paris-Sorbonne (Paris IV) with a degree in Philosophy. That’s when she started her career in journalism. She completed two internships in the publishing house of Pierre Laffont in Paris, then in the Sunday magazine supplement of The Independent newspaper of London. Charlotte speaks English, French and Italian fluently. In 2009, 23-year-old Charlotte worked as an editor-at-large at Above magazine, dedicated to art, fashion, photography and the environment. Charlotte was one of the founders of Ever Manifesto, the magazine that aims to draw attention to ecological problems caused by the fashion industry. Beside her passion for journalism and publishing, Charlotte has another major interest – she is a talented equestrian and still takes part in various tournaments. In 2009, she participated in the Global Champions Tour in Spain, Monte Carlo, Cannes, Rio and other cities. Charlotte grew up surrounded by horses and it is not surprising that horse riding became an essential element of her life. There is always time for trainings in the busy agenda of Prince Albert’s niece. Charlotte was placed in the saddle from the early age. She clearly inherited her passion for riding from her mother Princess Caroline who, herself, took part in different competitions. As a young girl she was trained by Olympic class riders Thierry and Philippe Rozier. Today, after a 17-year break due to her studies, Charlotte is back in the saddle again. In 2010, Charlotte met Frida Giannini, the creative director for Gucci, and became the official equestrian ambassador of the brand. Gucci designs her clothes for every tournament she takes part in. But Charlotte’s biggest inspiration remains her aunt, Princess Stephanie, whose lifestyle is far from what we call a royal behaviour. A turbulent love life, successful career steps in singing and design and a luxury of doing whatever her heart desires, Stephanie was the first to give Charlotte a horse named Emilie for her twelfth birthday. As Charlotte was standing on her balcony, she watched her aunt riding a horse and shouting: “Feel free, my dear! Emilie is ready to take you to the edge of the world”. Before Charlotte’s romance with the French comic, Gad Elmaleh, Caroline’s older daughter was spotted with Alex Dellal, son of the British property tycoon, Guy Dellal. In 2007, the couple attended the Ball de la Rose together. Two years later, they were seen at the wedding of Prince Albert II and Charlene Wittstock. Soon after this major event, the couple broke up and Charlotte was seen seeking comfort in the arms of Gad Elmaleh. Independent and freedom-loving Charlotte neglected all the traditions of the royal family and chose a common law marriage instead of a pompous wedding ceremony. In the very beginning, Charlotte and Gad kept their relationship secret. They first met at a mutual friend’s party in 2011. After two years of hide-and-seek with paparazzi, the couple made their romance official, walking the Rose Ball red carpet together. In December 2013, Charlotte had a baby boy named Rafael. He became the second illegitimate grandson of Princess Caroline. The son of Andrea and his wife Tatiana was also born out of wedlock. But soon after his birth, the couple got married. Unfortunately, Monaco didn’t have a chance to see Charlotte walking down the aisle of St Nicholas Cathedral. 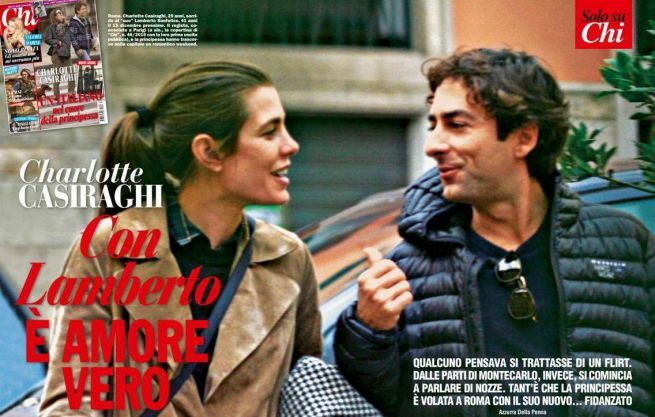 In 2015, rumour had it that Casiraghi and Elmaleh were about to end their 4-year relationship. That was made clear when Charlotte was spotted with 41-year-old Italian filmmaker, Lamberto Sanfelice. His first work, “Cloro” received a warm welcome at the Berlin International Film Festival. The Italian arrived in Paris last October to be closer to his beloved, and they are still together.